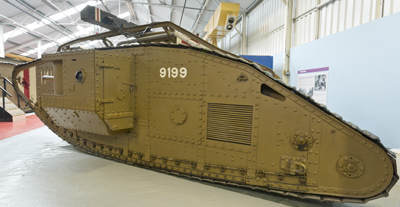 The first British tanks were around 8m long and 2.5m tall. On the devastated battlefields of the Western Front they would clearly attract enemy fire. 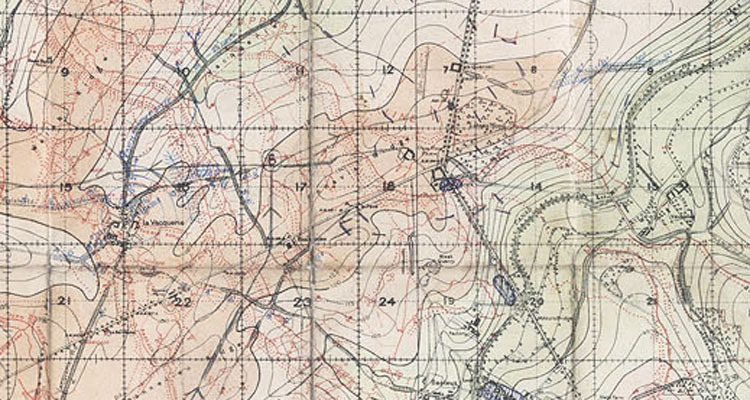 It was decided to paint them in a camouflage pattern in the hope this would make them harder to see, both on the battlefield but especially behind the lines. 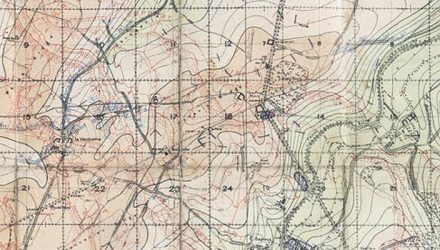 This was a major concern, as if German aerial reconnaissance spotted large concentrations of tanks they would have a good idea of where attacks could be expected, allowing them to move forces to defeat them. On the move there wasn’t much that could be done to hide the tanks from aircraft, but whenever they stopped crews made considerable use of camouflage nets and covers, as well as local terrain features such as woods or ruined buildings. They would also go to a great deal of trouble to hide or destroy the distinctive trails left by their tracks. Solomon J. Solomon’s original, intricate, camouflage pattern. In May 1916 the artist Solomon J. Solomon was assigned to the tank force and tasked to come up with a tank camouflage pattern. 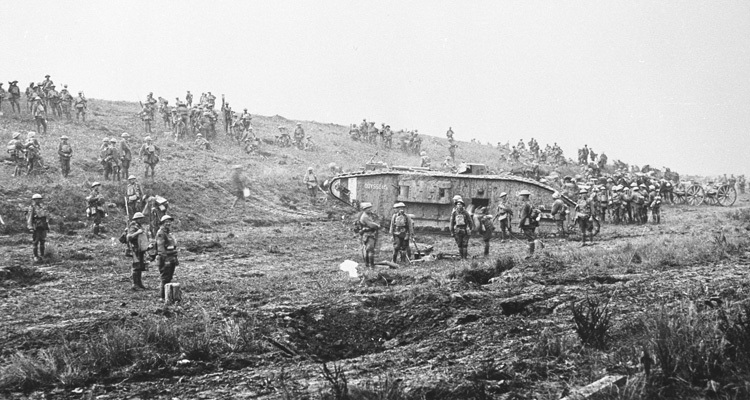 He devised an elaborate four colour scheme, which crews were required to copy exactly onto their own tanks. Once they arrived in France the crews were ordered to repaint their tanks in a simpler scheme that used solid blocks of colour separated by black lines. This was only applied to the sides, front and cab, suggesting Solomon’s scheme may have also only been used on these areas. This was how the first tanks to see action, on the 15th September 1916, were painted. Tudor-Hart’s ‘dazzle’ pattern included nets over the tracks. These weren’t the only camouflage patterns applied to tanks. In the spring of 1917 the artist Ernest Tudor-Hart devised a scheme that used the ‘dazzle’ principle. This used a range of colours and shapes that wouldn’t necessarily hide the tank but rather confuse the Germans as to its direction and speed. Hopefully this would make it harder to hit. His system also used netting to cover the roof and tracks, which, it was hoped, would make the tank harder to spot from the air. The ‘neutral brown’ colour scheme used on most British tanks. It was very quickly realised that, regardless of pattern, tank camouflage was virtually pointless on the muddy battlefields of the Western Front. The tanks moved very slowly, little more than walking pace, so they didn’t kick up mud in the way a modern mountain bike or 4×4 would. However because the tracks ran over the top of the vehicle any mud they picked up would run down over the sides, completely obscuring any camouflage pattern. 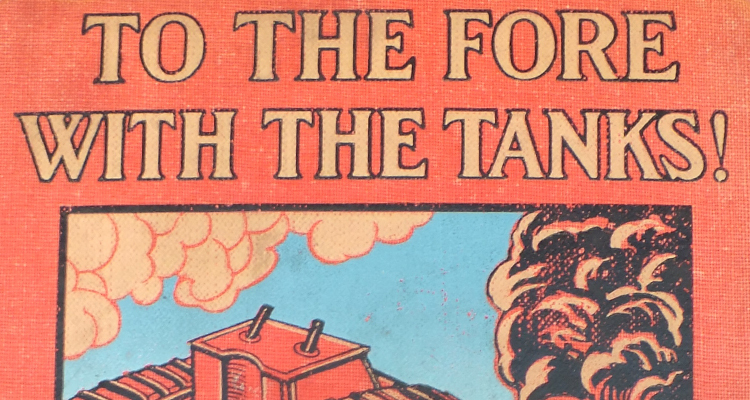 Surrendering to the inevitable, towards the end of 1916 it was ordered that the tanks should be painted in a ‘neutral brown colour’ all over. 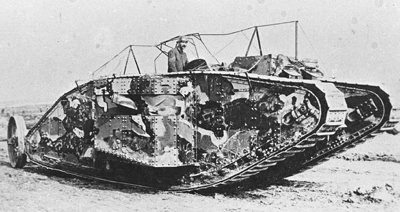 Although a few camouflaged sponsons were seen as late as Arras in April 1917, by the time the Mark IV was introduced in June the days of elaborate paint schemes on the battlefield were over. The three-colour scheme used on captured Mark IVs. 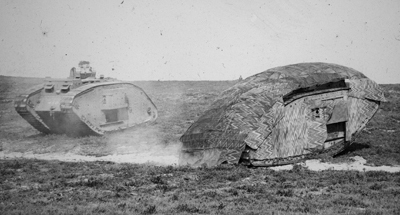 This wasn’t quite the end of the story of camouflaged British tanks. In late 1917 and 1918 the Germans captured over 170 Mark IV tanks, and repaired and refitted several dozen of them for service against their former owners. 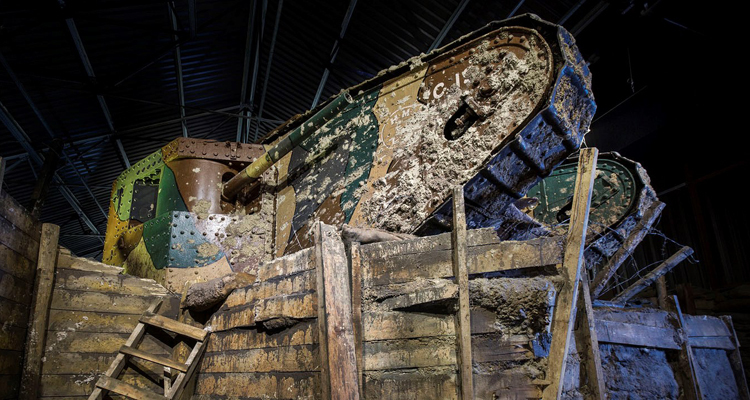 As part of this work the tanks were repainted in a three-colour scheme of clay yellow, green and red-brown. There were at least two versions of this scheme, called Buntfarben-Anstrich. The first intermingled the colours in a fairly complex pattern, however this was later replaced by simpler blocks of colour. 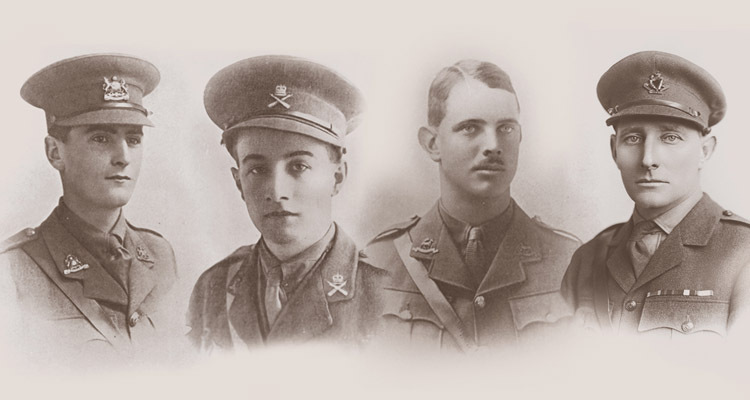 Read more about camouflage in David Fletcher’s article on camouflage prior to combat. Do you have the date and reference number of the source document that ordered that the tanks should be painted in a ‘neutral brown colour’ all over? What colour were they painted before and as they left the factory?